We’re changing it up once again this week. 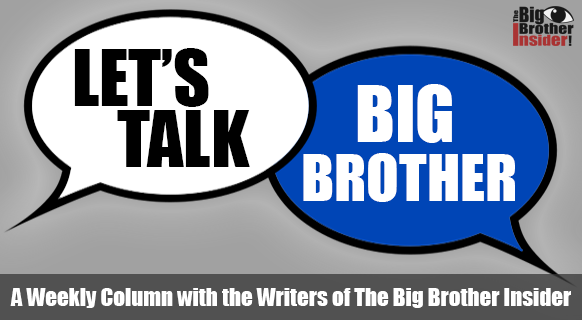 For this weeks “Let’s Talk Big Brother” we decided we needed to rant a little about Big Brother 18. Each of our writers chose a topic to rant and/or rave about. Paul’s Game - Rave: I’ve tried to keep my opinions off Twitter this summer, but many people have been asking me who I think should win or who I want to see win. Here’s my answer - If Paul doesn’t win, it will be one of the biggest disappointing seasons, for me, in a long time. I think Paul has played the best game this season. He escaped being the target the first couple weeks, he was the only one that was interested in discovering the secret room, he then had the round-trip return ticket, he’s been nominated and escaped eviction three times (going to be a fourth this week), and in general has played the best social game - especially when compared to the other six houseguests remaining. A close second to his game would be Victor, and although I’m against players coming back after they’re evicted, he did successfully BATTLE his way back into the game - TWICE! My dream final two would be Victor and Paul because I feel they’re most deserving, but if I had to pick - I want to see Paul win more than anything. Showmances - Rant: Let’s cut to the chase on this one - I’m not a fan of the showmances making it to the end of this season. We have three different “mances” making it to the final seven. We have showmances couples; Corey/Nicole, and James/Natalie. Then we have bromance couple; Paul/Victor. While it is admirable that these six have made it so far together, I’m ready for them to be broken up. I find it incredibly frustrating to watch Paul/Victor make a “Final 4” alliance with Corey/Nicole because we they’re only going to take each other so why would either of them put themselves in an alliance in which your entire game could be over at the final four because you took a showmance to the end. It’s equally frustrating to watch houseguests not take a chance at evicting half of a showmance. Last week is a perfect example, game wise, James should have voted to evict Corey, in my opinion. In doing so, that would allow him and Natalie to be the only remaining showmance in the house. I could continue on about this but I’ll spare you. “At the end of the day”, I just wish these houseguests could open their eyes and realize taking showmances to the end is NOT good for your game. The Bromance Showmance - Rave: I’ve never been a big showmance fan, with the exceptions of Jeff + Jordan and Brenchel, of course. But this season, there’s one showmance I’ve been obsessed with. You all know who I’m talking about, Paul and Victor! The bromance and the friendship between these two has been very entertaining to watch this season. They are a couple of underdogs and you can’t help but root for them! They both started at the bottom and now they’re on their way to winning this game. Plus, Victor was evicted TWICE this season!! I swear he has nine lives in this game. Each time he came back, you could see the joy and excitement on Paul’s face. If Paul or Victor ends up winning this game, it will be a great end for this season! We’re rooting for you Team Friendship! Corey Winning The BB Bribe - Rant: I think by now, I’ve made it perfectly clear that I cannot stand Corey one bit. I swear the wallpaper could play a better game and have a better personality than this dingus. But let’s get straight to this rant. HOW DID HE WIN THE CARE PACKAGE?! Like seriously?! Did production give Nicole a computer and vote 50 million times? Because that’s the only logical reasoning behind that. Yes I know it was probably all planned by production, and yada yada yada. But as a fan, I’d like to believe that my vote ACTUALLY counts! Plus this just feeds into these houseguests’ egos. They all think America loves them but that’s not the case! I just feel so bad for Paul and Victor because they probably think America doesn’t love them and that is not true at all! Victor Returning Again - Rave: At this point how could I not rave about Victor returning to the Big Brother house for the second time this summer? He has made Big Brother history as the first person to return twice in a single season! Based on his size, he should not have been able to stay on that wall for as long as he did and that speaks volumes about just how much he wants to be in this game! He may not be my favorite houseguest and he admittedly does not have the best social game but the guy has heart and I can definitely get behind that! Congratulations El Fit Vic! Michelle Stealing Houseguests Items - Rant: It is no secret that Michelle has been my least favorite houseguest this season. She pleasantly surprised me this week by not shedding a single black mascara filled tear when being nominated by Nicole. Then I made the mistake of turning on the live feeds only to find out Michelle has been stealing items from the other houseguests to sell on ebay after the show! Honestly how low can you get? If I were in that house and my stuff went missing I would be LIVID. Lying might be accepted in the Big Brother house but stealing should not be, I really hope production steps in on this one and forces her to return anything she’s taken. Showmances - Rave: I’ve got to rave on the showmances this season. I’m shocked at how well they're working and how far they’ve made it! You’ve got James and Nat, which are loved by America. So sweet, and until this week they have stayed off of everyone's radar! Plus, they have won some comps! Then, Ni-Corey. Nicole and Corey can win some comps when they have too, and somehow Nicole has managed to not be on the block at all this season! That’s impressive just in the game, let alone when you’ve got a partner! Then, I have to consider Paul and Vic a showmance/bromance. They’re so hilarious, they’re competition beasts, and they’re extremely loyal to each other! That’s real friendship. I love it. Of course Z, and Paulie were a fail, but still! The overall showmance strategy has actually worked well this season! Michelle - Rant: At this point, Big Meech crying could be its own segment every episode. I can't stand to watch her cry anymore. At first I kind of felt bad, but now I’m over it. Unfortunately, I hold self-proclaimed super fans at a higher standard than the other players, so before Michelle entered the house, I was a fan… but it is just too hard to root for her now. I understand that the game makes you emotional, and some people even use crying as strategy but enough is enough Big Meech, pull it together!